Attwood House Community Centre offers playgroup for preschool children and their parents and caregivers. 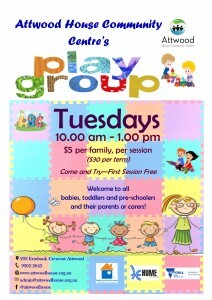 Playgroup is for babies, toddlers, pre-schoolers and their parents or care givers. At playgroup you get to meet other people going through similar experiences & gives your child or children the opportunity to engage in activities with other children. Fees: $5.00 per session or $30.00 per term per family, payable at reception.